The person smiled at me and we continued chatting a bit before the line was eventually released to check-in. 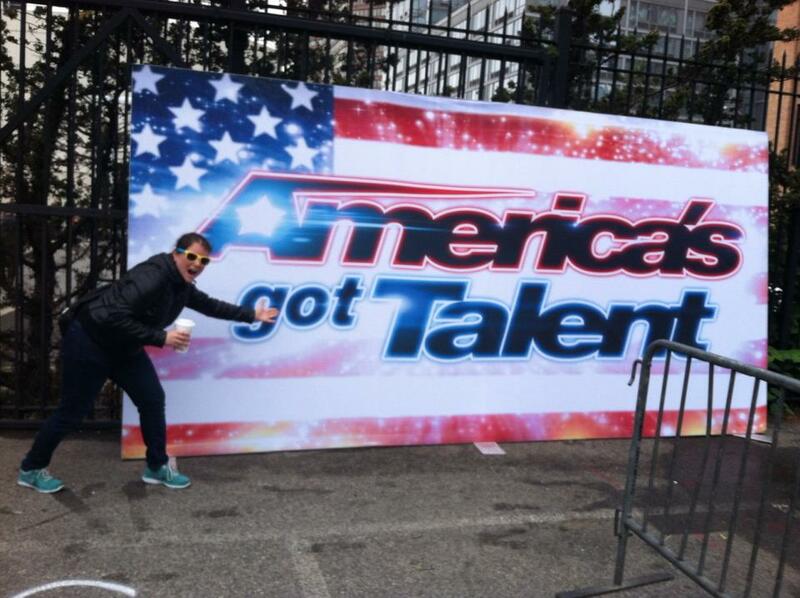 On Sunday, November 17, I auditioned for America’s Got Talent. So rather than detail what happened after I got through the registration line, I thought I’d share SIX positive life lessons I took away from auditioning for a TV Talent Show. You can’t sleep on your talents, your dreams, your aspirations or your opportunities. The biggest mistake you can make when it comes down to giving yourself a shot, going on stage and performing, trying something new or going to an audition is physically not being there. AND no matter the way the performance went, audition or first time trying something went–OR no matter the way you think the performance, audition, or activity went, be proud of yourself for giving it a shot, for maybe stepping out of your comfort zone–but especially for just stepping out of bed to get wherever you are going. Because let’s be honest, getting out of bed to be somewhere can often be the hardest part. And Positive Thinking is better. And there is absolutely a difference between having confidence and staying positive. Positivity will attract other positive people to you. If you stay bright and you keep a smile on your face–other positive people will flock to you. Trust me, you don’t want to be waiting for an audition (for anything) with an orb of negative energies surrounding you the entire time. 3. Passionate people are just more interesting. Having passion is more interesting than having experience. Being a passionate person about life and the joys of your hobby or your talent is much more interesting that simply a resume of experiences. You can have a lot of experience in something, but if if you don’t come off as interested and passionate about your craft–then it just won’t matter. Through auditioning for the show I had the opportunity to meet a mix of both experienced and passionate people. I got bored very quickly with people just rattling off their resume of comedy clubs they’ve performed at, but felt very enthralled in the conversations where people spoke with an excitement–a drive–a passion. The experienced people might get jobs or interviews–but the passionate ones change the world. 4. Be the best you that you can be. Whether it’s five people you are up against or 1 million people you are up against whether it be in an audition or for a job opportunity–the ONLY thing that matters in the audition room or in the application process is how you do–not them. You can’t control how someone else will perform under pressure. You can ONLY be the best version of yourself when it’s time to step up to the plate. 5. Know yourself better than anyone else. At the audition, after someone overheard me say I did comedy, he asked if I could do any impressions. I said I can do one impression pretty perfectly–myself. The more I’ve thought about that statement, the more meaning it has taken on. Be sure that before you try to do the impression of someone else in order to impress others–that you know one person better than anyone else in this world–and so that if anyone asks you who you can act most like–you can be honest and proud to say the best impression you can do–and the person you know better than anyone in this world is…yourself. 6. Let others inspire you. Share your stories and your talents with others–and also let others share their stories and talents with you. You never know–Someone might just inspire you. Posted in Fun and tagged America's Got Talent, aspirations, Auditions, chance, Chances, Change the world, Dancers, dedication, Dreams, Drive, excitement, Experiences, Howard Stern, interviews, Life, Life lessons, NBC, Nick Cannon, opportunities, passion, Posh Spice, Singers, Stand Up Comedy, talent, talent show, the hobby hoarder, Woody Allen. Bookmark the permalink.